Winds maxing out at 90 km/h in some parts of southwest B.C. have made for dangerous conditions on roads, with downed trees and power lines. At least 400,000 homes are without power. 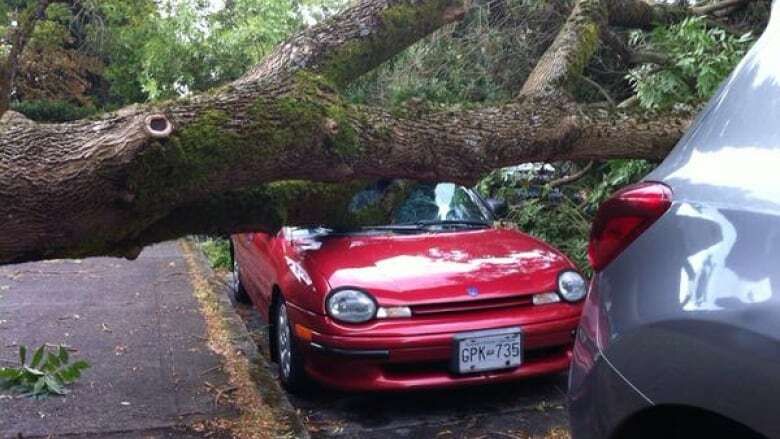 Vancouver Island and the Sunshine Coast are also experiencing damage from the winds. Environment Canada says winds peaked at 117 km/h on Saturna Island. High winds forced the closure of Vancouver's jewel, Stanley Park, although the east side of the park re-opened Saturday afternoon. The annual Pacific National Exhibition initially said it would close but later announced it would stay open after Environment Canada cancelled a wind warning. BC Hydro has a huge list of outages it's trying to repair in the Lower Mainland, largely in Port Coquitlam, Pitt Meadows, Langley, Abbotsford and Surrey. "What I can tell you is that we have all hands on deck... to repair damaged lines," BC Hydro's Kevin Aquino said. "We had a number of trees and branches come down on wires knocking out power." Spokeswoman Simi Heer said the utility has launched its storm response plan, bringing together decision-makers into one room in Surrey to ensure efficient deployment of crews and resources. Heer said the outages are due to trees and branches falling on power lines and crews are working hard to repair damage, but customers should be patient. "Crews might simply have to remove a branch from a line, or they have to go in and repair the line or repair the pole," she said. "Windstorms are challenging because the degree of damage is quite varied." The authority asked through Twitter that people stay 10 metres back from fallen power lines, or roughly the length of a bus. BC Ferries has cancelled sailings to and from the Southern Gulf Islands due to high winds. Some vessels travelling in and out of Tsawwassen, the ferry terminal south of Vancouver, are holding in Active Pass, waiting for winds to ease. RT. Effective immediately <a href="https://twitter.com/ParkBoard">@ParkBoard</a> are closing <a href="https://twitter.com/hashtag/StanleyPark?src=hash">#StanleyPark</a> for public safety. Pls do not attempt to visit park today. There were delays on the Vancouver-area's SkyTrain as a tree fell across the tracks at Royal Oak Station. Transit authority TransLink was setting up a bus bridge to help move people to their destinations, and asked riders to avoid using the transit system if possible. Surrey RCMP said it's busy responding to trees down across cars. At least one person was struck by a tree. It was unclear what the extent of the person's injuries were. Several agencies were urging people to stay home. 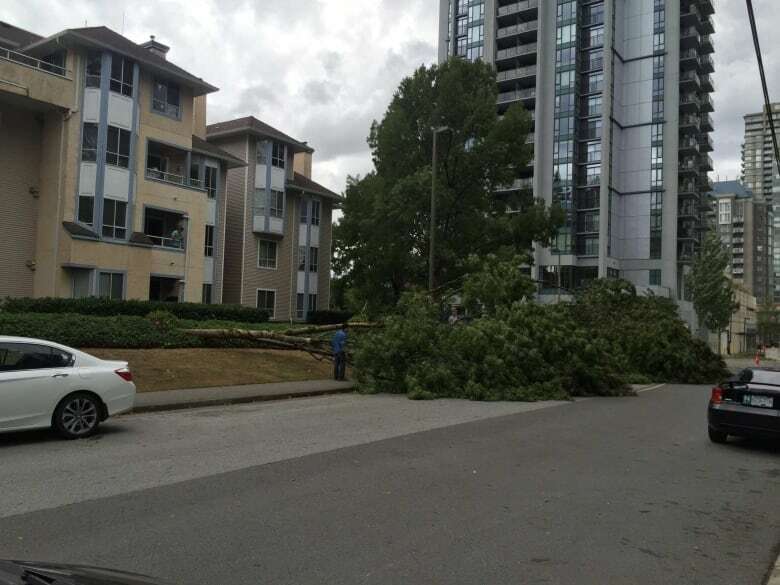 Surrey RCMP said multiple trees fell down, crashing into cars and striking a pedestrian. "There have been also been several near misses between trees and members of the public," Sgt. Bill Parmar said. "The current storm is making it very dangerous for the public and the first responders." Parmar said a woman was walking with her daughter when she saw trees falling. She was trying to warn other pedestrians and drivers when a tree fell on her. RCMP said her daughter jumped out of the way, but the woman, in her 40s, was rushed to hospital with life-threatening injuries. Mounties were trying to identify her and find relatives. Abbotsford police also urged residents to stay indoors. Winds blowing up to 70 kilometres per hour were forecast for Rock Creek, where a 44-square kilometre wildfire has been raging for weeks. "As there has been no rain to dampen the old fire ash, residents are advised there may be flying ash, and weakened trees in the fire area may fall," the B.C. Wildfire Service warned on its website. "As well, debris from damaged or destroyed homes may become susceptible to the strong winds and move about." The wildfire, which has now been 75 per cent contained, destroyed 30 homes in the community in B.C. 's Kootenay Boundary district earlier this month.